It was just the other day that a friend of mine noticed all of his Picasa albums were set to public. We went in to try and make them private, but it turns out that each album had to be done individually. And, when you have 87 albums it makes it nothing short of a long and annoying afternoon; after marking the first 10, we gave up with doing it manually. Now, we’re happy to share that Google recently updated Picasa to let you change the privacy of your albums all on one page. 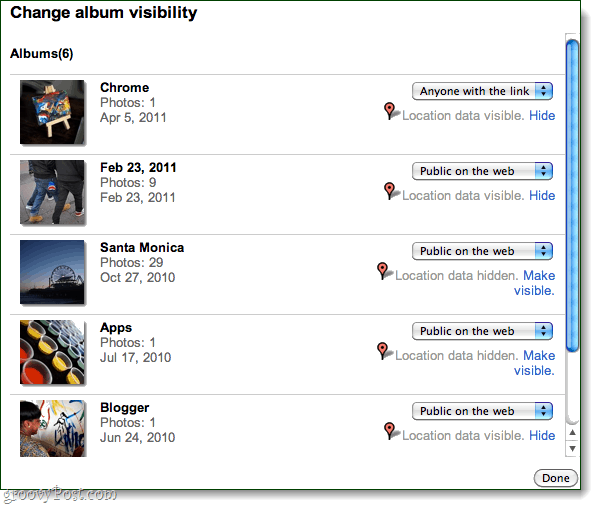 To change your privacy settings for multiple albums at once, just visit All Albums page of your Picasa Web Albums account. Then Click the Edit visibility button. To share in total privacy your Picasa album, you can use TudZu. TudZu is an application to share photo and videos in total confidence (P2P and secured) with your friends and family. TudZu include a plugin to share your picasa album without using Picasa Web Album. – and share it in your private network. I’m having this problem and this solution does not work. I’m trying to change all my albums that are listed “Public” to “Anyone with Link”, however the Public albums aren’t even listed to be ABLE to change! !